The HRC fuse element carries the short circuit or faults current for the specific interval of time. And if the fault removes in that specific period then the fuse element remains safe and it does not melt or breaks. The fuses element is kept inside the airtight container. The HRC fuse has inverse time characteristic, i.e., if the magnitude of the fault current is high, then their rupturing time is low and for low magnitude fault current the rupturing time is high. When the fault current passes through the fuse, the fuse element melt and break. The enclosure in which the fuse element is placed is filled with the chemical powder. The vapour of fuse element and the powder together form the high resistive substance which extinguishes the arc. The construction of the fuse element is similar to the low voltage fuses. In this type of fuse, the fuse element is wound in the shape of the ring for removing the corona effect. In some of the HRC fuses the two fuse elements are used. These fuse elements are connected parallel to each other. The one element is used for the flows of the normal current, and the other is used for short circuit current. The fuse element for heavy current is made of tungsten metal because of high resistance property. The liquid type HV HRC fuse is mostly used in the high voltage circuit. It is used for the transformer protection or for the circuit having a rating higher than 400A. 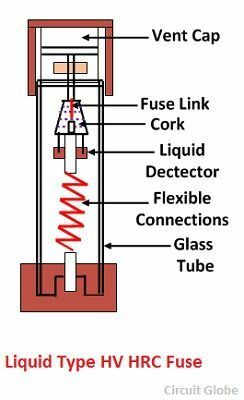 The fuse has the glass tube which fills with carbon tetrachloride. The fuse element places inside the glass tube. The one end of the tube is sealed, and another fix at the end of the glass tube by the help of the phosphorous bronze wire. When the fault occurs, the shortcircuit current passes through the fuse element. The fuse element becomes melts and breaks. The small quantity of gas generated at the time of fusion. The liquid uses in the fuse extinguish the arc. Such type of fuse is used as the backup protector of the circuit breaker. The HRC fuses increase the short circuit capacity of the circuit breaker. Thanks for posting such a good article on fuse. Your website is really worth it for getting knowledge on electrical engineering.